You will Watch Action League Now!! Season 4 Episode 8 online for free episodes with HQ / high quality. 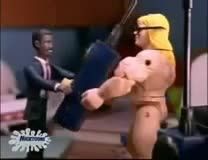 Stream cartoons Action League Now!! Episode 46 A Flesh of Brilliance. Information stored in The Flesh’s brain (in order to keep it away from a new villain known as Smarty Pants) results in him gaining immense intellectuality. But as soon as the transportation takes place, the Action League realize how much they dislike the new, smart Flesh. Once Smarty Pants successfully gets his hands on the League and holds them hostage, it’s up to Flesh to rescue them, and only winning a game of chess will do the job for his opponent.